There’s no feeling quite like attaining a lofty goal. And in the world of high school sports, goals come no loftier than the blue trophy. Each August in New Mexico, as summer in the desert casts its final brutal rays over practice fields and fans attempt to turn their thoughts to autumn Friday nights despite still sporting shorts, 127 teams’ worth of athletes strap helmets onto heads filled with one collective dream: a state championship. The majority have never experienced that midfield celebration. What’s special about sports at the prep level is that such facts are irrelevant. Every team, from those whose trophy cases are empty to those whose are heavily laden, believes the same thing in August: Why not this year? Why not us? Residents of other communities often ask about the pressure of being an Artesia Bulldog. To be sure, aspiring young football players in Artesia are well aware of the history surrounding their program. They’re not, as many are fond of joking, handed an orange football at birth or marked as potential quarterback material in first grade. They do, however, know their football stadium – itself a legend in the state – houses a museum. And they know what’s inside. Not only does the Hall of Champions contain decades’ worth of memorabilia, it holds the stories of the teams dating back to the 1950s that, whether by the skin of their teeth or by blowout, won it all. Just to the east of the Hall sit their spoils: 29 blue trophies. Far and away a New Mexico record, the tally is third in the nation, as well – behind two teams that have been counting since the early 1900s, while the ‘Dogs took their first title in 1957. All of that could easily translate into pressure, if not for the dynamic of the Artesia football program. The athletes therein know beyond doubt they are not just valued for their on-field talent but as students and young men. They know their community is behind them regardless of outcome. They know their teammates are more than that; they are brothers. The 2015 Bulldogs were a shining example of that mentality. They refused to rest on the laurels of a state title win in 2014. They overcame setbacks, battled through adversity, and found a way to win when it seemed all might be lost. Their state playoff gamut saw them find an extra gear in single-touchdown quarterfinal and semifinal victories, and many in the state assumed there were none left for the likes of undefeated Centennial. The top-ranked team in 5A was undoubtedly playoff-caliber in 6A, where they would head at the conclusion of the school year. They were bigger. They were, the numbers said, better – just enough. But that sort of pressure is the brand the Bulldogs know and on which they thrive. And when, following their 42-34 win, they gathered at midfield with the 29th trophy in hand, they all, without exception, credited their brothers. There are facets of sports that simply can’t be taught, and an unshakeable devotion to the team is one of them. It’s a powerful potion, and any squad starting the season with it is already that much further ahead. An overall total of 18 players with varsity experience will return to the field this season from that ‘15 lineup. In terms of starters, the ‘Dogs have six back on offense, seven on defense. It’s a very healthy core, a solid mix of experience and leadership, and first-year head coach Rex Henderson is excited about it. “We’ve got a real good group coming back,” Henderson said last week. “We have a lot of leadership and a lot of guys who made big plays for us a year ago. Henderson and his athletes know, however, that experience alone does not a cohesive unit make, particularly with key losses in a few positions necessitating restructuring. Helping to swiftly push the team in the right direction is its attitude coming into the season – and that doesn’t mean with the start of preseason workouts. “We had a good round of two-a-days, and that was kind of precipitated by a good summer, which really went back even to the spring,” Henderson said. “These guys were real excited after they won state a year ago. Some of them have been a part of two championships now, but the guys that were part of last year’s team were particularly excited, and they went to work. That level of commitment not only impressed their coaches but altered their anticipated timelines, as well. Henderson was able to implement certain aspects ahead of schedule due to the pace the team has set. “I feel like we were so far ahead of where we usually are just because of the work the kids put in, not really because of anything to do with us,” he said. “They’re fired up. So we were putting stuff in earlier than usual, which let us get a lot out of the summer and two-a-days. That sent the Bulldogs into their annual intermural scrimmage against Onate eager to see how they measured up in game-format competition. 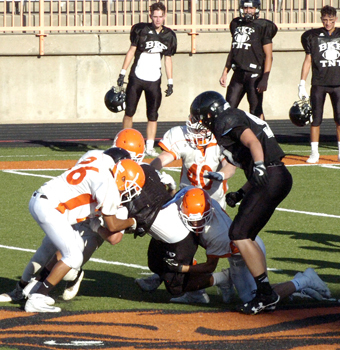 Both squads experienced the expected glitches, but Artesia showed both big-play and consistent capabilities on both sides of the ball. “When you’ve been going against yourselves since April and that’s all you’ve seen except for a few seven-on-sevens, it’s good to just see a live situation and really get to evaluate how we handle pressure, how we handle being in live action against another team that doesn’t know what we do and doesn’t really care. While the preseason scene at Bulldog Bowl feels like business as usual, there’s undoubtedly one major difference. Longtime Artesia High School head coach Cooper Henderson announced his resignation in early March after 27 seasons at the helm. His back-to-back titles in 2014 and 2015 were numbers 13 and 14 on his career list at Artesia, his 15th overall as a head coach dating back to his five seasons in Ruidoso from 1984-88. And in 2015, he was named the National Federation of State High School Associations’ Football Coach of the Year. The prospect of a change after nearly three decades came as a shock to the community. But when the Artesia Public Schools’ announcement of the Bulldogs’ first new skipper since 1989 was made just two short weeks later, it was both a familiar name and face: Rex Henderson. Both Cooper Henderson and Rex’s father, Butch Henderson, were Bulldogs under the direction of their dad, L.G. Henderson, who led the team from 1960-73 and compiled five state titles. While Rex’s prep career took place a little to the east in Lubbock, Texas, he, too, had the opportunity to play for his father. Henderson moved on to attend Angelo State University from 1996-2001, majoring in history and beginning work on his master’s in the same before taking an assistant coaching job in Artesia under his uncle in the fall of 2001. He completed his master’s at ASU in the summer of 2002. Henderson says being a head coach has always been his career goal, and although life occasionally put those plans on hold, when the opportunity to both pursue that goal and remain at AHS presented itself in March, he didn’t hesitate to apply. “I became a head track coach kind of earlier in life than I thought that might happen, so I enjoyed that for a while,” Henderson said. “Then I got married, had a son, and kind of put becoming a head coach in football on the back burner. With Cooper Henderson remaining at AHS as athletic director and continuing to work with the football program’s sophomores, and with the Bulldogs’ staff of assistant coaches remaining unchanged save the addition of a replacement for Rex, the transition has been a smooth one. “I’m enjoying it,” Henderson said. “I’m really having a good time, and I’m excited to get started and see what we can do. The coaches have been really great. For one, they stuck around. No one bailed on me, so I’m really pleased about that. While the Bulldog football team’s preparations for the upcoming season have remained essentially unaltered, the schedule they’ll be heading into in 2016 has not. The first thing fans noticed upon release of the docket was the team at the very top: Carlsbad. While both communities were shocked to find the late-September tradition that is the Eddy County War would now be the Bulldogs’ and Cavemen’s inaugural foray into action, those who make the valiant attempt to keep up with district alignments in New Mexico quickly sussed out the reason why. Classification and alignment in the New Mexico Activities Association (NMAA) has taken its place over the years among life’s various mysteries. Teams have been shuffled and reshuffled again, districts have been expanded and cut, and communities nowhere near one another have ended up district mates. The 2016-17/2017-18 edition of alignments has done much in the way of the latter while also ensuring several Class 6A teams in particular don’t have much in the way of a regular season; four games, to be exact. “When people look at any of our major schedules this year, one of the first things they’re going to notice is that those 6A schools that we normally have played year in and year out, particularly Hobbs and Carlsbad, either aren’t there or are in very different places,” Cooper Henderson said. Carlsbad and Hobbs found themselves removed from their district with nearby Clovis and plunked into a bloated seven-team district that also includes Las Cruces high schools Las Cruces High, Mayfield, Onate and Centennial, as well as Gadsden. Clovis, meanwhile, will be forced to travel to Albuquerque and Santa Fe for all of its district games against Eldorado, La Cueva, Manzano, Sandia and Santa Fe High. So while part of the fun – as well as the opportunity for more stringent preparation – of the regular season has long been inter-class bouts, most in 6A now simply have no time for them. “These teams have almost no non-district games now,” Henderson said. “Fortunately, Hobbs was already the second game on our schedule, but if we wanted to play Carlsbad this year, it had to be one of the first games or else we weren’t going to be able to play at all. 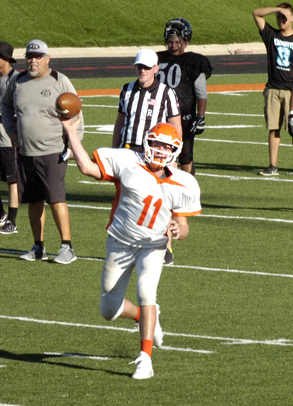 Each year, a slogan is selected that serves as something of a rallying point for Artesia’s athletes, a simple phrase to inspire them or remind them of an aim. “It’s kind of a spinoff from the movie ‘Unbroken’ and the idea of what kind of foundation an athlete lays for their character and their life, and whether they’re able to push through the hard times and handle adversity,” Rex Henderson said. “Unbroken” (2014) is based on the story of U.S. Olympian Louis “Louie” Zamperini, who survived for 47 days in a raft following the crash-landing of his aircraft during World War II, then was forced to endure a series of prisoner-of-war camps. The 2016 Bulldogs will be taking that mindset into their final days of preseason workouts, into the oddly-early Eddy County War Aug. 26 at Bulldog Bowl, and beyond, as they work each day to make their goals an unbreakable reality. “We want to get better each day, each week,” Henderson said. 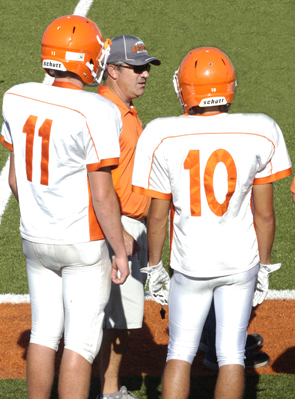 “In Artesia, I don’t think anyone is ashamed to say our long-term goal is always to win a state championship. That’s got to be the end goal for every team.